Heat focaccia as directed on package. Meanwhile, in medium bowl, combine artichoke hearts, bell pepper, cucumber and salad dressing; mix well. Place 1 focaccia, flat side up, on cutting board. Top with half of the turkey, all of the vegetable mixture, the remaining turkey, cheese and sprouts. Cover with remaining focaccia, flat side down. If necessary, secure with toothpicks. Cut into 8 wedges. Focaccia is a flat, round Italian bread with a firm crust and a chewy interior. Before it's baked, the bread is brushed with olive oil and sprinkled with salt, chopped fresh rosemary or Pramesan cheese. Sometimes holes are poked into the surface of the dough to give it a dimple texture that holds the toppings. Look for focaccia in the grocery store bakery or deli. 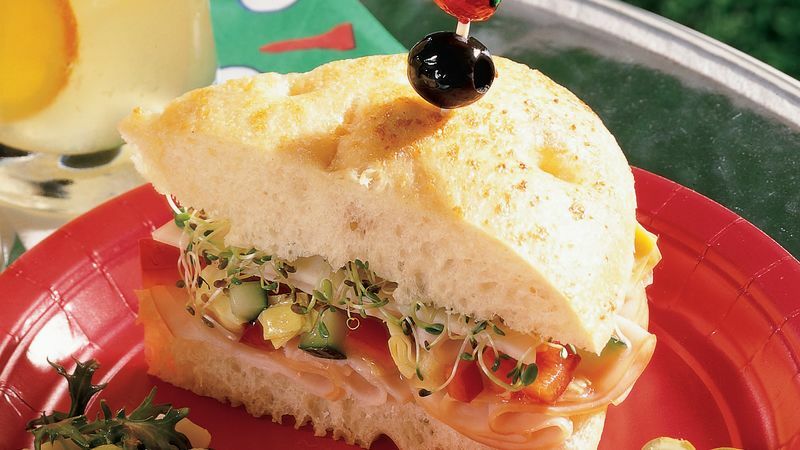 Prepare the artichoke, bell pepper, cucumber and salad dressing sandwich filling a day ahead; cover and refrigerate. Finish assembling the sandwich just before serving.